Forget Spring, Summer, Fall & Winter – wedding season is my favourite season of the year! It’s only January but most makeup artists like myself are gearing up for another busy year of bridal beauty. There is just something about brides – the wedding dress, the hair, the makeup, the excitement – no matter what your physical attributes brides all look stunning on their big day! If you’re walking the aisle this year and you’re not sure how you should do your hair or if a smokey eye is appropriate, you’ll want to read up on the latest bridal beauty trends for 2011. Here are some of my favourite and inspiring looks of the season! The Carolina Herrara show was full of inspiration! I love the elegance and simplicity of the hair and makeup. 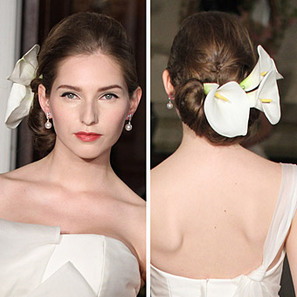 It’s simple but with the gorgeous calla lilies (one of my favourite flowers) the look has a modern feel to it. The hair is pulled low and slightly to the side with volume at the top. I love how the calla lilies peek through on the side. 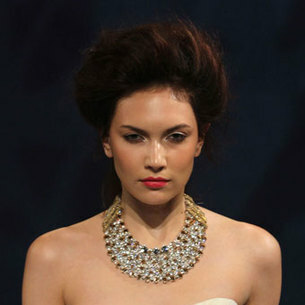 This would be gorgeous with an asymmetrical or off-the-should gown. Black liner will be a huge trend for this wedding season. It’s just so elegant, polished, and finishes the eye without adding a lot of colour. The skin isn’t dewy but luminous with a flawless finish. The lips have a nice creamy coral finish. I like the coral shade because it’s so fresh for Spring/Summer weddings. The brows are also prominent and a must for this polished look. I love the flapper ’20’s feel of this faux bob look. The waves and the finish of the hair is loose making it look more modern. The freshness of the makeup also gives it a more modern twist. If you have long hair and don’t want to have it completely off your face then this is a great alternative. If you love boho-chic then this is a look for you. Everything about it is so ethereal. I love this look for brides doing a destination wedding on a beach. If you’re also not a tiara or veil type of gal, this is a great choice. Loose waves are a must for this look. The makeup is gorgeous! For the most part, the overall look is very sheer but the smoky definition along the bottom of the eyes gives this soft look a bit of edge. But even though the eyes are given definition, remember to smudge the liner to compliment the overall softness. This is a classic look that would be stunning on just about anyone. I love the glowing skin and effortless hair. 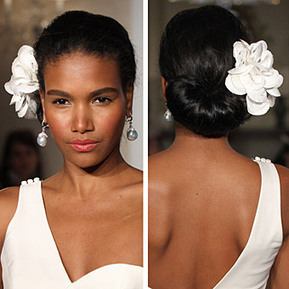 This is another look perfect for a beach wedding. All the eyes would need is a soft shimmery shadow, brown liner smudged into the lash line, mascara, and a highlighter in the inner corners of the eyes to make them pop. Then use a cream blush or a bronzer with a bit of shimmer to give the cheeks a lovely glow. The lips are neutral but not pale so you still see your lips. The waves are loose and flowy. I love that one side is pulled back while the other side has some waves framing the face. I always thought that a flower or hair clip should only be placed on the side that is pulled back, but the flower on the other side totally works. Nothing says blushing bride than blushed, rosy cheeks. If you’re not a big makeup wearer, wearing blush will do wonders. Adding blush to the cheeks instantly perks up your complexion giving you a healthy glow. Blush is especially important for your wedding photos. You want to have a bit of definition and want to avoid looking too pale. Rosy pinks and peach shades work for almost every makeup look. A traditional smokey eye is a popular request I get from a lot of my brides. I love a smokey look but am delighted when a bride wants to try it in a colour. This season you’ll be seeing it in gorgeous violet and steely-blue tones like on the bride pictured above.A smokey eye is pretty dramatic but adding colour to it can scare a bride away! To keep this wedding-appropriate and looking like yourself, I recommend applying a sheer shadow in a lighter tone of violet or steel-blue across the lid. Then line the eyes top and bottom with a dark violet or blue-grey pencil. Dip a smudging brush in a powder shadow in a similar shade and smudge over top of the liner to give it a smokey effect. This will also keep your liner on longer. Add a few coats of mascara and you’ve got a subtle coloured-smokey eye! Keep everything else on the face neutral, using peachy tones or soft pinks on the lips and cheeks. Those that read my Makeup Junkie blog know that I’m a little obsessed with bright pink lips. 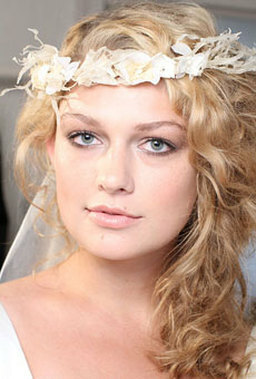 A misconception that a lot of brides have is that you don’t want to add to much colour to your face on your wedding day. When done right, I think a pop of colour looks fresh and radiant. It will not only look striking in person but look gorgeous in photos. To prevent the look from looking garish, pair a bright pink lip with soft neutral eyes in bronze, sheer golds or champagne. If you’re not blessed with a set of full lashes, apply brown liner to make your eyes stand out. Bronzed cheeks will give you a beautiful glow and colour without taking away focus from the lips. However, soft pink blush on the cheeks is equally lovely and girly. If going all out with a full colour lipstick is too dramatic for you, try using a bright pink stain first then applying a bright pink gloss over top. You want your lip colour to last and a stain will do just that. Otherwise, go with a semi-matte lipstick over a creamy lipstick. It will bleed and feather less. Don’t forget to line your lips with a pencil in a similar shade! 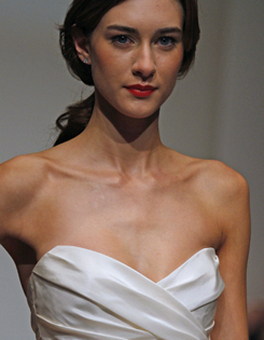 Red lips will never go out of style and are back for this wedding season. It’s a classic. This Spring the red is more vibrant, but for your wedding day you’ll want to skip the trends and go with a shade of red that suits your skin tone. Those with fair to medium skin should choose a true red with blue undertones. Those with medium-dark and olive skin tones should go with a warm red like brick or red-orange. Tan to dark skin should stick to deeper shades of red in wine or burgundy. Because red lips have the potential of smearing, I recommend using minimal gloss. Using a lip liner is a must for red lips as well. You don’t want to worry about your lips bleeding and smearing all day. 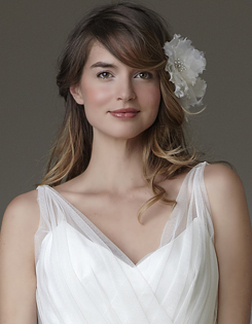 What bridal beauty trends do you think you’ll want to do for your big day? How did you do your hair and makeup on your wedding day?